To view a larger image file, click here. The quilt was made in 1991 by Kat Hall, Sally Hunter, Neil Anderson, Bayly Watson, Janet Dunn, Jane Costello (Neil’s sister) and other anonymous friends. The idea to make this quilt came from some of us who were unable to say our goodbyes to Neil when he died in London in 1990. The male symbol background in red and blue, which Sally and Kat took off a print that Neil had made himself during his early years whilst studying graphic design at the then Wellington Polytechnic. The four God Bless Us Nelly Queen’s prints, which are taken off three larger original prints that Neil had made. The symbol is the Lamba symbol and the phrase refers to his Catholic background and his gay identity. Neil with boxing gloves on the front page of the Pink Triangle magazine, which symbolises some gay bashing episodes he suffered. Neil also redesigned the logo and design format of Pink Triangle. Neil at his Primary School in Porirua, aged 8. Neil arrested during the Homosexual Law Reform Campaign. The photograph is on his Obituary page in the Pink Triangle magazine. An anonymous friend who used to fly kites with Neil made the kite. Kumura Junction refers to where he was born, although, he spent some of his childhood growing up in Titahi Bay, now part of Porirua, Wellington. Wellington, where he came out and spent his early years as a gay man. Paris where he commuted to see his partner David. London where he lived his life from 1987 until his death. Leather was chosen for the words, as it symbolised the leather jackets that he wore in London. 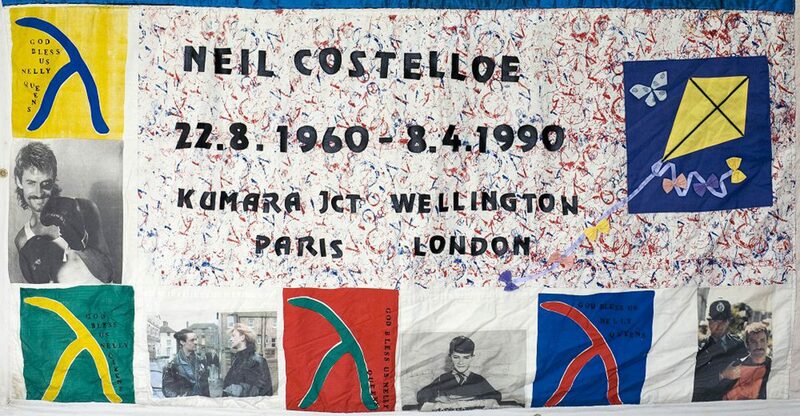 Neil Costelloe was one of the most important activists during the Homosexual Law Reform Campaign, 1985-1986. The NZ lesbian and gay communities owe this heroic and courageous man a great deal of gratitude. I remember Neil and Shane Towns, also lost to AIDS and other gay activists at the wonderful Pipitea Street (Wellington) house. So many actions planned there, many by Neil Costelloe. Before Neil left for London he was very active in the community. The flat in Pipitea Street, Wellington, that he shared with so many other young gay men served as a centre of gay activism at the time. During the Gay Law Reform campaign, a group wanted to stage the first gay ‘sweatshop’ performance ‘gay only drama’ in New Zealand. Neil created the poster referencing the work of a gay designer, Keith Harring in his finished design. Martin Sherman’s “Passing By” was staged at Circa Theatre in Sept 1985. Neil’s poster for it is now part of the gay archive held in the NZ National library. If you wish to add your memories to this page, please get in touch.